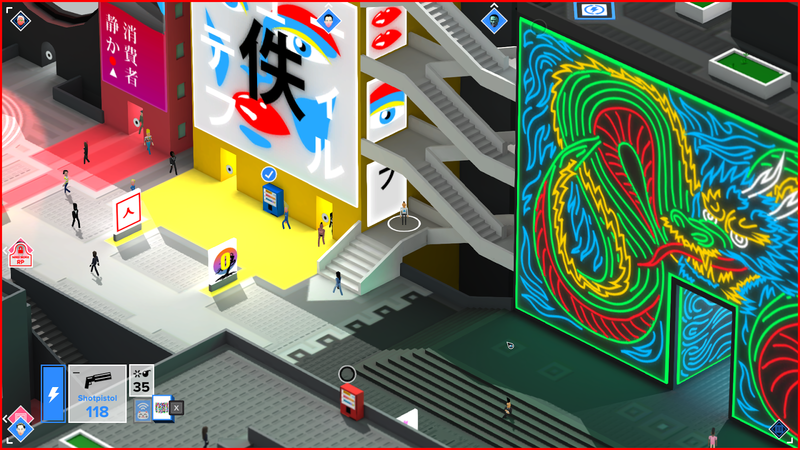 Tokyo 42 is a quirky little game, from SMAC Games and Mode 7, that drops you into a colorful futuristic world and tells you to start murdering others for fun and profit. You can leave any moral qualms about that behind, since everyone in this world is taking a wonder drug that allows them to be brought back to life almost immediately. This is fortunate for you character as well, since you will die...a lot. 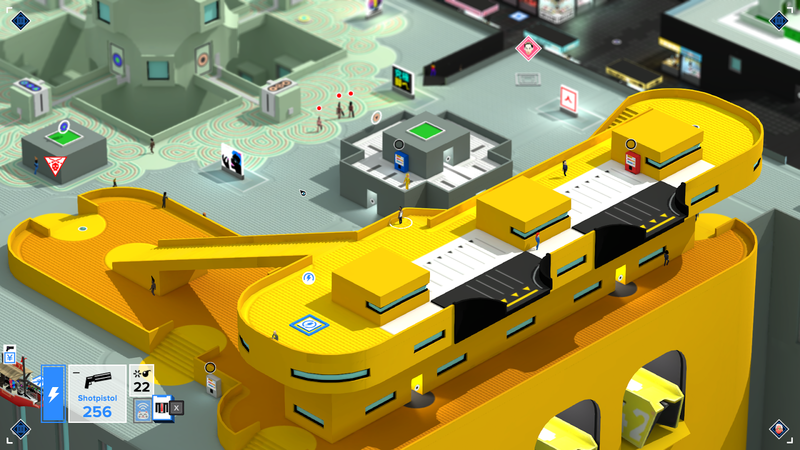 The developers of Tokyo 42 describe it as "the lovechild of Syndicate and GTA 1" which I would agree with. I thought it had a strong Hotline Miami vibe as well. The game sets you loose in an open world city where you can search for various terminals and characters offering assassination missions. There are 100 missions to complete, as well as dozens of collectibles scattered around the world, so expect to spend a good long time in this world if you are planning on doing everything. Most of the missions boil down to killing people, but in many cases there is some kind of twist to the action, or an interesting context for your extra-judicial murder sprees. As you complete these missions you will earn money and reputation, which lets you buy new gear and open up more missions, respectively. There is a story that ties this all together, but I won't spoil it, since it's interesting enough to enjoy as you go along. Visually, the game is very appealing. While the graphics are fairly simple in technical terms, the aesthetic is wonderful. The city is full of colorful buildings, peaceful natural areas, and strongly contrasting industrial areas. 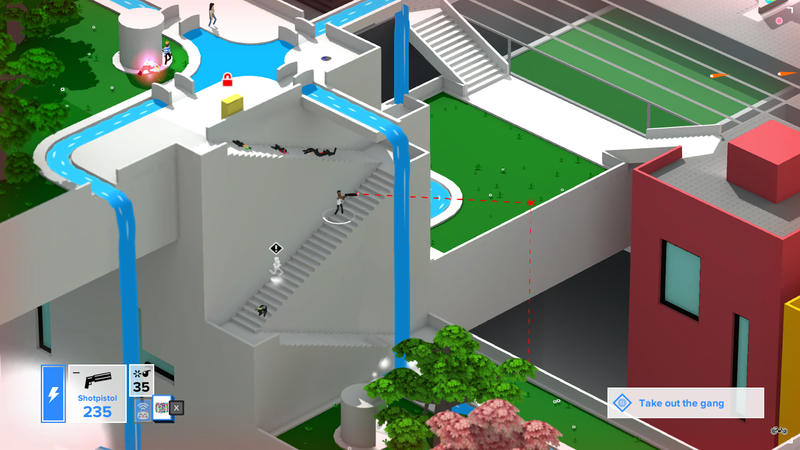 The game can be almost surreal at times, as you trot through the Utopian vistas, gunning down enemies while catching more than a few innocent civilians in your crossfire. The map world is quite large and it will take you some time to explore it all. There are waypoints scattered around the map which you can instantly teleport to once you activate them, so you won't have to be making long treks too often. 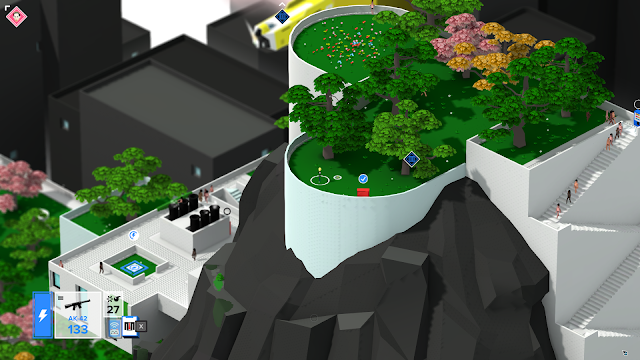 The map is also covered in save points, one of which you can have active at a time. Usually there is one right next to where a mission starts, so if you die you can just tap a key and try again instantly. 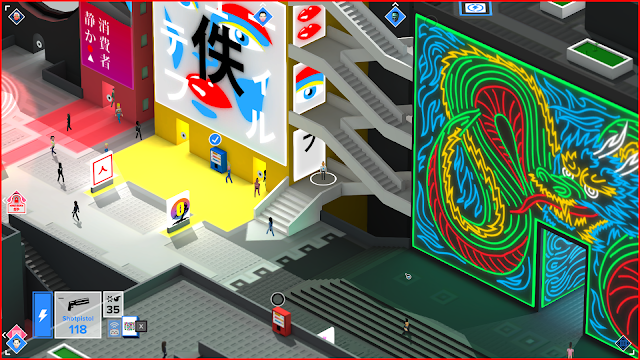 The gunplay in Tokyo 42 is not perfect, but it is generally fun. You simply move the mouse where you want to fire, and a line will show if you have line of sight to that spot or not. Where this becomes less than perfect is when you are in a very vertical combat space. This is a bit of a double-edged sword for the game. It's very cool to have a shootout on some stairs on the side of a building, but it is less cool to think you are aiming at one spot, only to find you weren't quite aiming where you thought. With some practice this gets better, but you will have the occasional shot that will simply not go where you wanted it to go. The other hurdle here is dealing with the camera. On PC the Q and E keys are used to rotate the camera around, with 8 possible positions. This can be tricky in combat when you also need to be using WASD to move. You can also sometimes find your view completely blocked by a building. I suspect it works much faster and better with a controller. Mechanical issues aside, the combat is enjoyable. One hit kills are the rule for yourself and most enemies, so you have to smart as well as quick. Ducking behind cover and sneaking to a new location is often the better choice than charging ahead guns blazing. Speaking of guns, there are several classic options available. Pistols, shotguns, assault rifles, grenades, sniper rifles, rocket launchers, and even a katana make up your arsenal. Several variants of each weapon can be purchased, letting you customize your play style. Enemies come equipped with these different weapons as well, so you have to stay on your toes. Bullets from the various weapons travel at different speeds, so you need to time your shots with that in mind. You also need to keep that in mind for dodging all the enemy fire coming your way. You won't always be able to stay in cover, forcing you to dodge and aim at the same time to stay alive. Remember, one hit and you're dead. Fortunately, there are often checkpoints throughout the longer missions, so you don't always have to start all the way back at the beginning. The open world nature of the game lets you approach many of the missions in a manner of your choosing. You can find a perch on a nearby building to snipe from, or sneak in and take foes out one by one with melee attacks. A couple grenades and a burst of machine gun fire can work wonders as well. Sometimes a mission will give you a specific condition for victory, such as killing in the target in a certain way. This can add a little extra challenge if it forces you out of your normal approach. There are also missions that put you in a more unique situation. A couple of memorable ones had me taking super long range sniper shots in one case, and killing enemy gangs while riding a motorcycle in the other. Needless to say, there is a ton of variety here. As I mentioned before, the open world contains numerous collectibles to be, err, collected. There are various skins and bonuses to be found in some tough to reach spots. A bit of puzzle solving and platforming ability will be needed to get them all. The world is also filled with fun little easter egg type moments to discover. The world between missions can also be hostile at times, especially as you proceed in the story and become the target of assassins yourself. The game has a multiplayer mode which sounded like a lot of fun, but unfortunately I was not able to find an active match. It puts you into the open world where you can pretend to be a civilian, strolling around and gathering arms, then unleashing when you think you've found another player. Sounds like it could be a lot of fun even with just a friend or two. Overall, I found Tokyo 42 to be a fun little assassination adventure. It isn't a must buy, but if you do like it, it will keep you entertained for a good long while. It's a very easy game to jump into and do a few missions if you don't have time for a longer game session. The action is solid, minus the occasional camera issue, the visuals are wonderful to look at even after hours of playing, and there are quite a few funny moments to discover, making this a charming game to just sit back and enjoy.